Off Queen Ruki's calendar this quarter of the year is her Accra community tour which commences on 9th September.The tout is powered by One Family Yard with triple collaborative support from Bakano Lakeview Resort, One Love Entertainment and One Love Artshop. 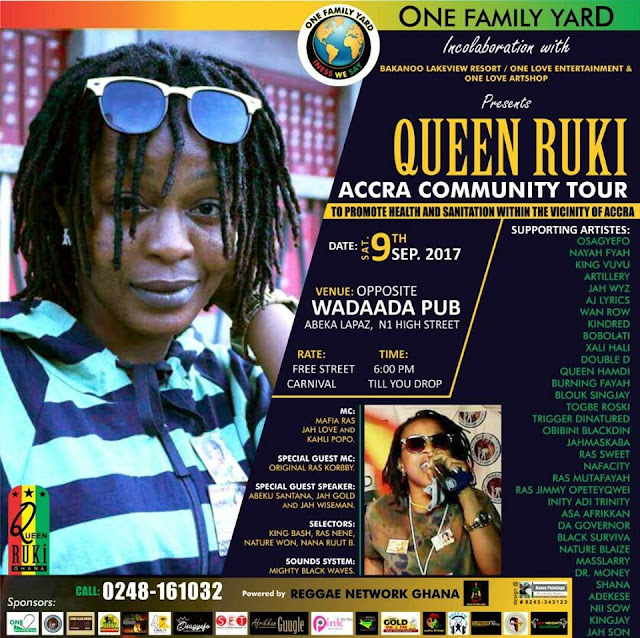 Queen Ruki is currently one of the very few rising female reggae-dancehall artistes in Ghana. The degree of zeal and seriousness she pushes towards her young career is a clear indication that she really means business and she is highly poised to go all out to ensure her success in the game. This tour will surely open her out to many new fans who haven't yet seen her perform on stage before. It is more like an exposure concert to showcase her game presence to multiple Accra communities, just so her brand can be engraved on the minds of reggae-dancehall followers. She has over 20 artistes supporting her tour, listing even some of the great talents who are already making loud waves on the game. For more details of this tour, study the above flyer .